Students do not have the same learning needs when it comes to writing. 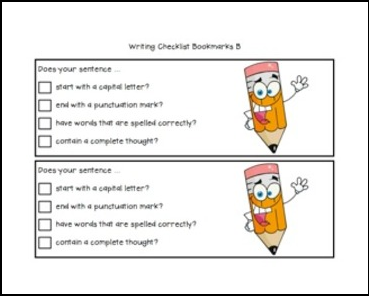 Use the tiered bookmarks to provide each student with a checklist that matches their writing needs! 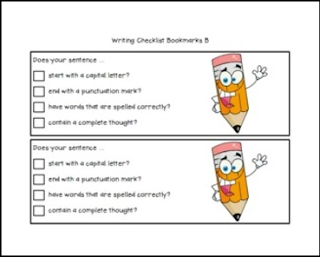 The writing checklist bookmarks are available in black and white and color. There are five different types of bookmarks. Each bookmark contains a checklist of writing skills. The bookmarks are scaffolded. Each bookmark builds on the skills found on the previous bookmark. Mount the bookmarks on card stock. Provide each student with a bookmark that matches their current level of development in writing. Students use the bookmark to ensure that they have included the different aspects of writing in their sentences. - writing a complete thought. The next bookmark adds spelling to the other skills on bookmark A. Added to this bookmark is the use of interesting words and using 6 or more words in a sentence. This bookmark is the same as “C” except the “have words that are spelled correctly” is removed. The last bookmark is a template that can be tailored to the unique needs of your students. Use this bookmark to target skills that you want to focus on with your students. Assessment and Goal Setting in Writing.